Marina d’Arechi is 1nm south of Salerno commercial harbour. The waypoint at the Marina entrance is at 40° 38,740'N - 14° 48,645'E. It is marked at night with a green light on the head of the main breakwater and a red light near the gas station. The main terrestrial reference point is the Arechi football stadium. 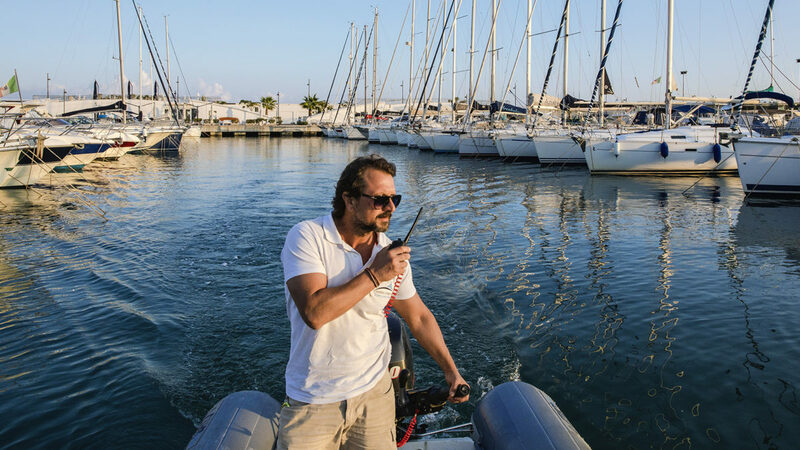 Marina d'Arechi dock staff is available 24/7 and must be contacted before arrival and prior to departure on VHF 74. Upon arrival, please provide the following information: vessel name, vessel length, and berth code (if known). The assistance of a small dinghy boat may also be requested on VHF channel 74. The Marina staff, once contacted, will be at your berth on arrival to assist with line handling. Maximum speed at the entrance and inside the Marina is 3 knots. You must sail under this limit when crossing the green light, in order to avoid dangerous accidents or difficult situations to vessels close to the gas station. Pilotage is not mandatory. The mooring system at Marina d'Arechi is “Med” or “stern to”. For yachts on all piers and docks, the mooring system consists of two bow mooring lines (ground lines). Anchoring is not allowed within the Marina. The bunker station is located near the C dock, and is open all year long (working days and hours may vary according to the season). It is equipped with 14 dispensers supplying up to 400L per minute (tax-paid and duty-free options available). Visitor yachts have to register at the Marina office just after completing mooring operations. If customs formalities are required, no one apart from the captain should leave or board the vessel until clearance has been completed. Marina d’Arechi offers the following electricity options: 16A, 32A, 63A single phase (220V), 63A, 125A, 250A three phase (380V). The available power at each berth depends on the berth size. The power available changes according to the dimension of the berth. The use of reducers and/or adaptors needs to be expressly authorised. Swimming and fishing inside the Marina are strictly forbidden. The Marina has its own certified diver. Diving by any other unauthorised people is prohibited. Black and grey water pump-out is available on request. It is prohibited by Italian Law to discharge any liquid waste within the Marina. The harbour master will be notified in the event of violation. It’s also forbidden to use the on-board WC if draining directly into the sea. Do not leave garbage on the docks or next to the small litter bins. Garbage should be bagged and tied, then properly placed in the designated receptacles. Marina d'Arechi also offers MARPOL certified hazardous waste disposal and can also dispose of large quantities of garbage on request. Please call the marina office with 24 hours prior notice for collection. Disposal of oils or other contaminates in the garbage bins and receptacles is strictly prohibited. Marina d’Arechi complies with the ISPS standards. All vessels arriving at the Marina subjected to the security legislation must send to the Marina office the Ship Pre-arrival form at least 24 hours before the scheduled arrival time, or at the latest in the moment the vessel is leaving from the last port, should the cruising time be less than 24 hours. The Marina may not allow berthing to vessels not providing such information. Minor repairs and yacht cleaning operations are allowed in the Marina assuming due consideration to your neighbours and the environment is being observed. Pontoons and jetties are to be kept clear of all dinghies, equipment, spares, sails, etc. at all times. Noise must be kept down from 2 pm to 4 pm and from 12 am to 8 am, when it is also forbidden to turn on engines for trial and/or battery charge purposes. If deck lights are used, please ensure they do not intrude on other boats. Dogs must be kept under control at all times. It is forbidden to use light or acoustic signalling within the Marina. Peace needs to be assured from 2 pm to 4 pm and from 12 am to 8 am. During this time frame, it is furthermore forbidden to turn on engines for maintenance audits or recharging of batteries. Only on-board electric barbecues are permitted in the Marina. For shore side barbecues, please contact the Marina office for approval.